Presenting another innovation from San Jamar. 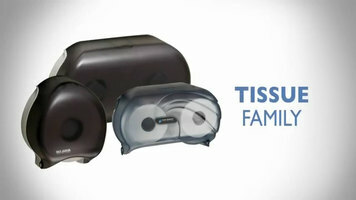 Wasted tissue is a costly concern with traditional dispensers. There’s stub roll waste and there’s inefficient dispensing. 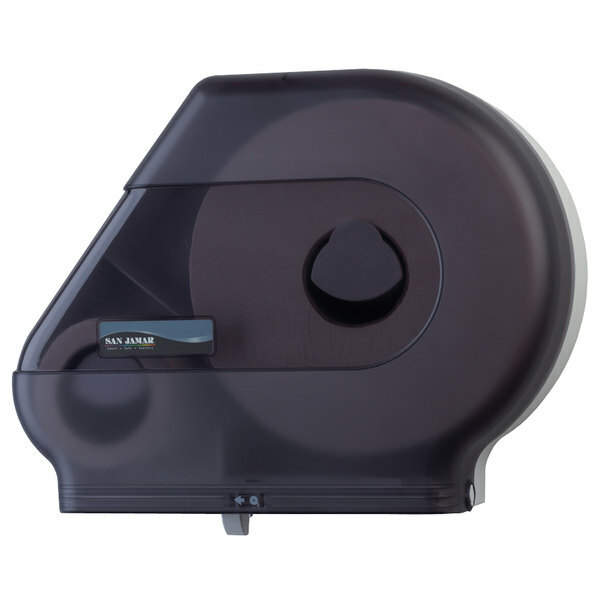 From single roll, to twin, to large roll, San Jamar offers a full line of quality dispensers that will fit any washroom. The Versa-Twin has a compact, contemporary, and space-saving design that accommodates any brand of standard or industrial bath tissue. The unique infinity roll system in our twin dispensers ensures that the first roll is completely dispensed before the second roll is accessed. This eliminates stub roll waste and reduces tissue cost. 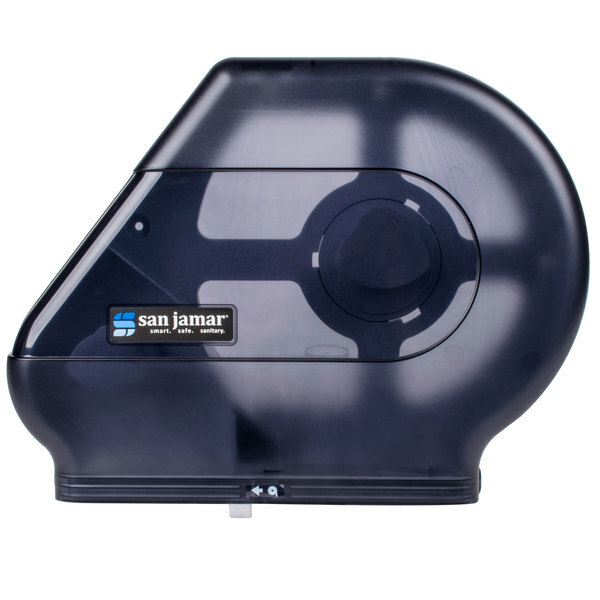 San Jamar large roll systems feature an easy to turn mange roll that limits dispensing friction. 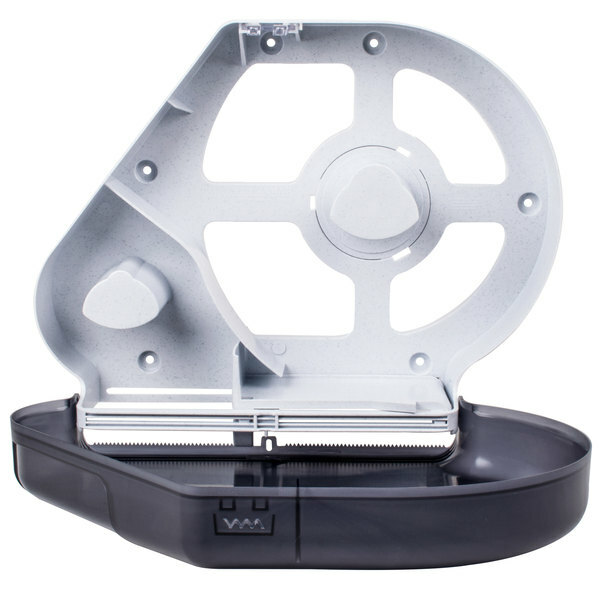 The result is a dispenser that’s smoother and easier to use, even with larger, hard to dispense rolls. 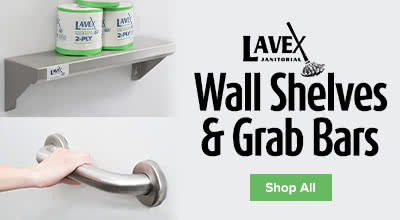 With a complete, versatile line of San Jamar tissue dispensers, you have a wide selection of solutions for dispensing standard or jumbo sized rolls, featuring styles that are compatible with our roll towel dispensers to give your washroom a fresh, uniform look and to minimize wasted tissue. For more information this and other smart dispensing products, visit sanjamar.com. 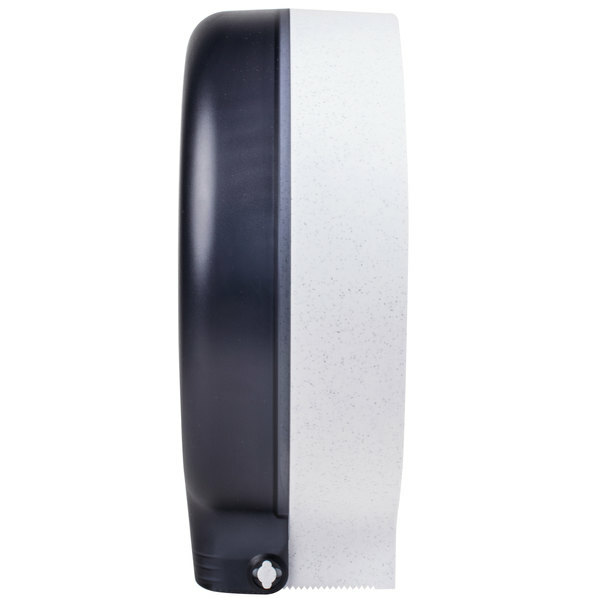 Reduce waste and provide a sleek, uniform look to your washroom with San Jamar tissue dispensers! 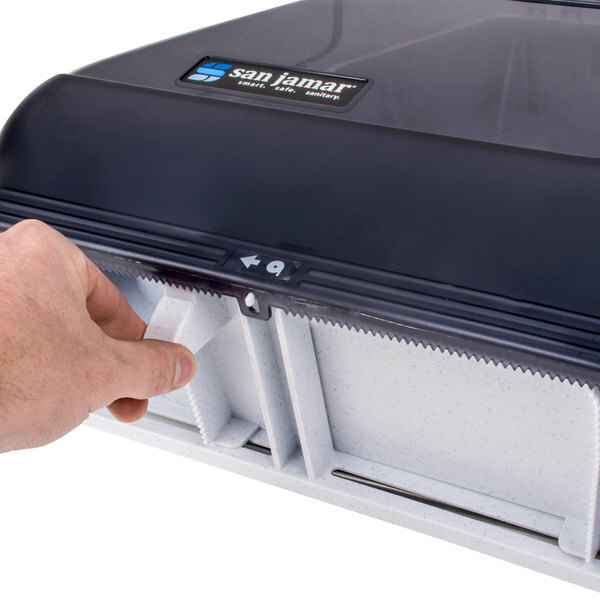 From standard tissue dispensers to twin and jumbo dispensers, San Jamar offers a solution for any washroom. Check out this video to learn more. 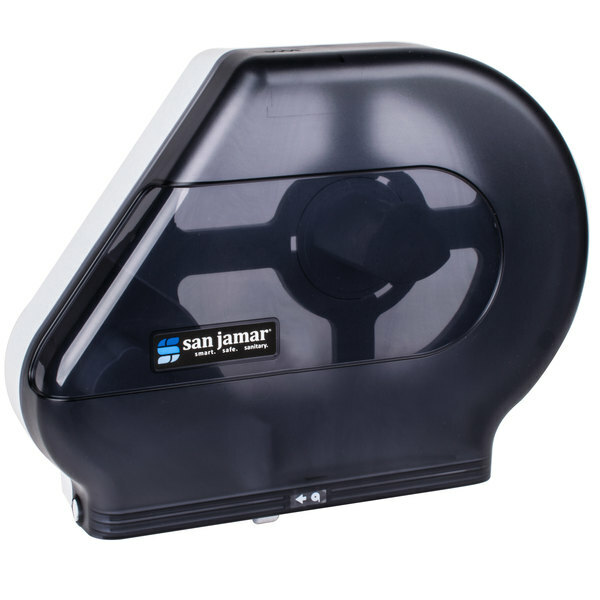 Made of break-resistant plastic with a sleek black pearl color, this San Jamar R6500TBK Quantum toilet tissue dispenser is an attractive and efficient addition to any establishment's restroom! 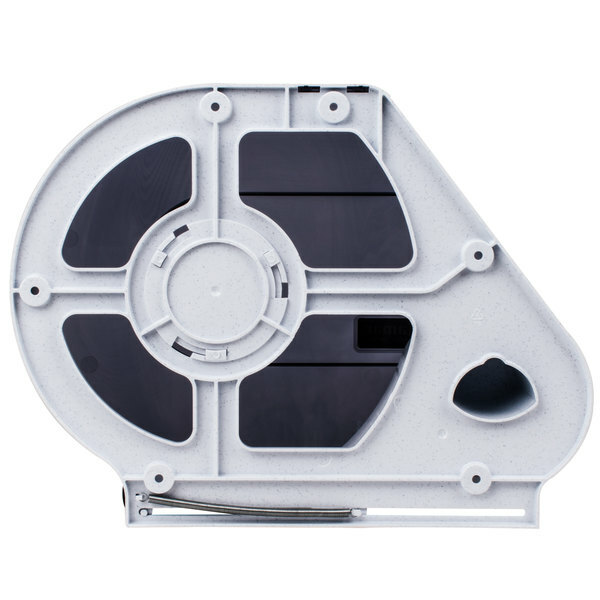 It can hold one jumbo toilet tissue roll ranging from 12" - 13" in diameter with a core diameter of 3 1/4", and also has a separate section for a stub roll. 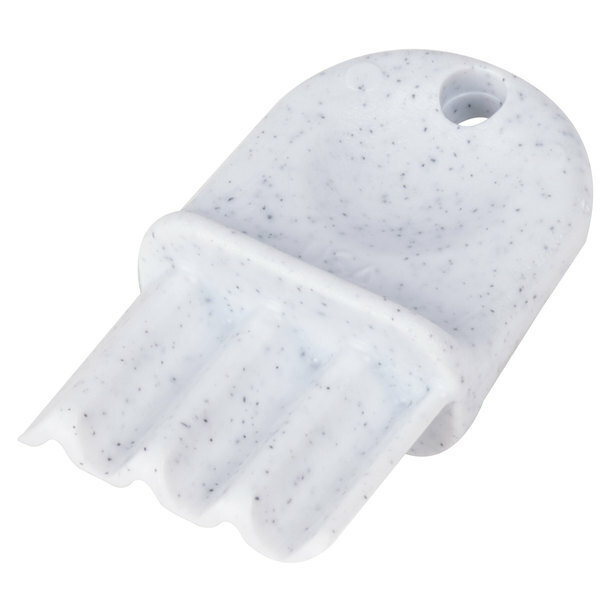 Simply load your fresh roll of jumbo bath tissue and, once it has been used down to a 6" stub roll, move it into the stub section and load a new roll into the jumbo section. 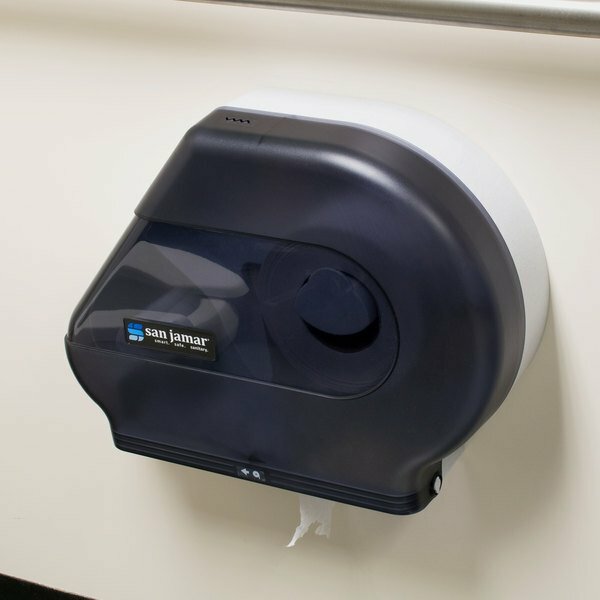 This new roll will become accessible only when the stub roll is finished so that you can now use every last sheet without worrying about your dispenser going empty! 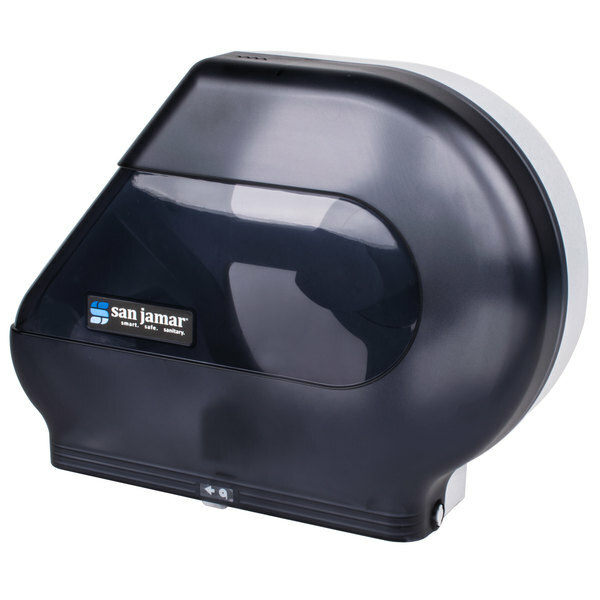 San Jamar 12" tissue dispenser with stub roll. This dispenser holds one full 9" or 12" roll of tissue and one smaller "stub" roll. Sliding door on the bottom prevents new roll from being used until small roll is used. up.